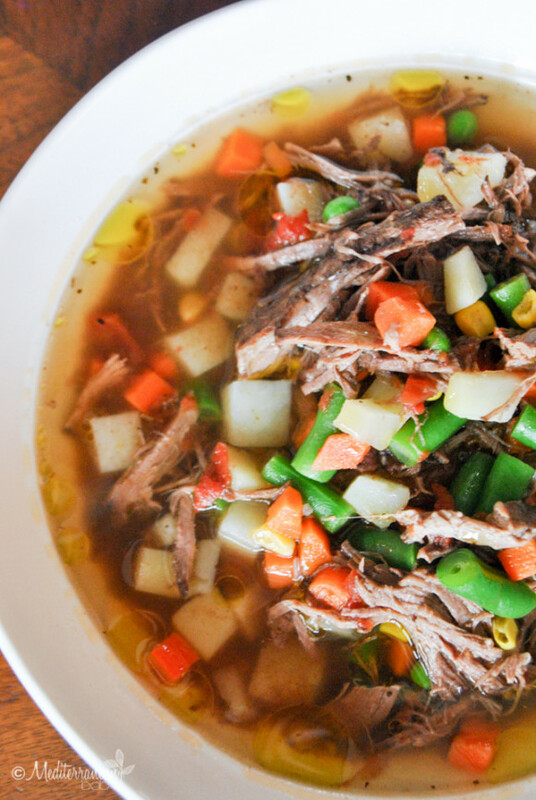 A good, hearty, flavorful soup is perfect this time of year to warm your tummy and share with loved ones. 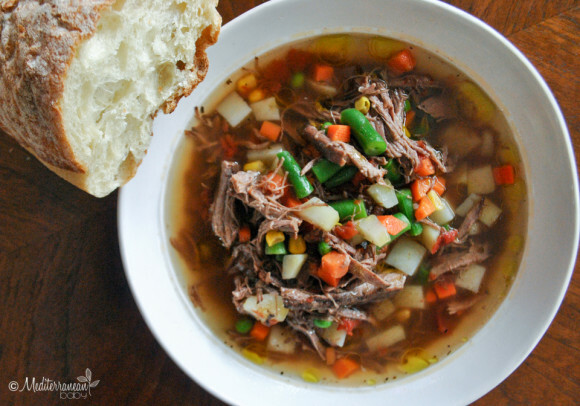 This Slow Cooker Beef Vegetable soup fits the bill and makes enough to freeze or share with relatives. We shared ours with our Yiayia Fifi and Thea Jeane as it’s their favorite soup. (They are accustomed to the Eat ‘n Park and Kings variety and they assured me that mine is better! WOW! Huge win for me!!) For some reason, delivering soup to loved ones on a crisp fall day seems like love and a warm hug all wrapped up together. I hope your family enjoys it as much as we did! My mother-in-law showed the kids how to drink the broth and they are in soup heaven! 1. Add roast, tomatoes, brown sugar, and red wine to the slow cooker. 2. Generously season with salt and pepper. 5. Place the meat back into the slow cooker with all of the juices. 6. Add chicken stock, potatoes, veggies, and bay leaf. 7. Cover and continue to cook on low to 4 hours. Note: You may cook the roast overnight and then make the soup in the morning to be ready for lunch. Also, you may par boil the potatoes and add them to the soup and slow cooker to cook on high for an hour. I can attest DELICIOUS !!!! !